There is probably no more American holiday than Independence Day, and I can think of no better way to round out your celebration than with old fashioned desserts. Pies, cobblers, crisps, slumps, and more–all might have roots in other cultures, but all also relied on seasonal availability here in the good old US of A. All these old fashioned desserts are also great either warm or at room temperature, making them perfect picnic, potluck, or cookout fare. I hope you’ll find something you’ll enjoy! 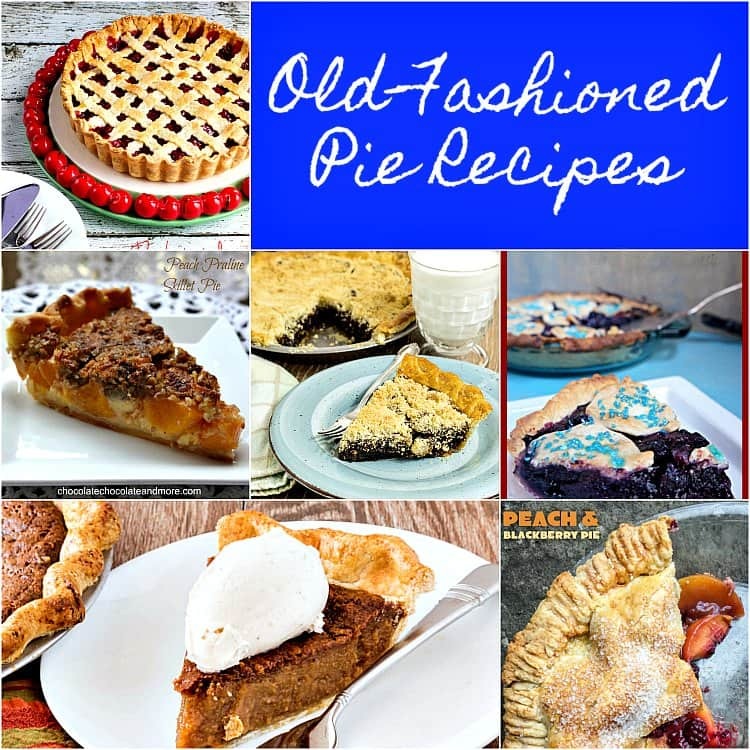 You’ll find plenty of fruit pies here: mixed fruit, apple, blueberry, peach, etc, but there are also some wonderful recipes for lovely custards and a classic Shoo Fly Pie. Damn Fine Cherry Pie Just like the names suggests. You really can’t go wrong here! Peach Praline Skillet Pie Juicy peaches, flaky pastry, creamy custard and crunchy praline. Sign me up! Old Fashioned Chocolate Chess Pie Like a gooey, rich brownie in a crust. Perfect Peach Pie Who doesn’t love a beautiful peach pie? Simple, classic, and delicious. Classic Shoo Fly Pie Super old-school, molasses-based with an amazing crumb topping. If you’ve never tried it, do give it a shot. Cinnamon Sorghum Custard Pie Rich and gooey. 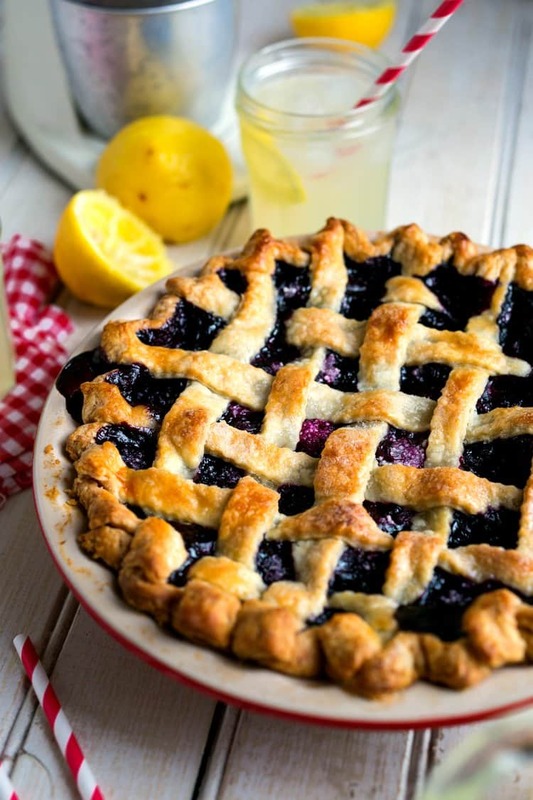 All-American Blueberry Pie Classic with a twist: an applique crust. Lovely. Peach and Blackberry Pie Mixed fruit pies are some of my favorite. This peach and blackberry number is just gorgeous. Deep Dish Cherry Pie Elegant. A true show-stopper for your picnic basket or dinner table. Indiana Sugar Cream Pie Think of this, Indiana’s State pie, as a sliceable, nutmeg-scented, vanilla pudding in a crust. Yes. Classic Lemon Chiffon Pie Make sure you bring this pie to your picnice in a cooler, but do bring it. Summer perfection. Mixed Fruit Galette Make a crust, fold it up around your choice of sweetened fruits, and bake. Done. Grandma’s Apple Pie (Bars) All the flavor of an apple pie in an easily transportable bar form. I also have a bonus Blueberry Pie for you from my wonderful and talented Pie Queen friend, Kate McDermott. You can find her perfected recipe for Blueberry Pie in her comprehensive and delightful cookbook, (affiliate link) Art of the Pie: A Practical Guide to Crusts, Fillings, and Life. 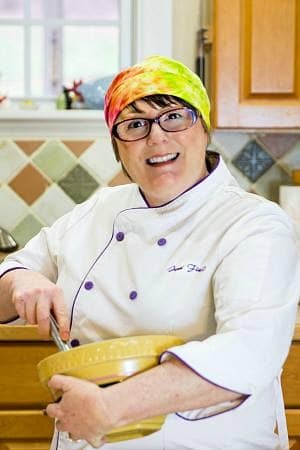 Be sure to visit Kate at her site, Art of the Pie. I’ve chosen a handful of pie plates that have an old fashioned feel to them, even though they aren’t antiques. While a standard aluminum pie pan turns out gorgeous pies with crisp crusts, sometimes it’s nice to have a fancy plate for presentation’s sake. Upside down cakes, crisps, cobblers, buckles, slumps, and more–all the old fashioned desserts filled with fruit! Fruit desserts lend themselves to all sorts of baking dishes, from ramekins to mini cast iron skillets to oval and square bakers, the look of your bakeware can really help to show off the desserts you bake in them. Here are some of my picks. Thanks for supporting PCO by shopping through my affiliate links. Lavender Mixed Berry Crisp Culinary Lavender goes beautifully with berries. You’re going to love this summery dessert. Blueberry Peach PandowdyNever has such a dowdy dessert been so pretty. Nectarine and Cherry Crumble A beautiful combination for this classic crumble. Strawberry Peach Sonker with Milk Dip Sonkers are the specialty of Surry County, NC, and if you live outside the area, you may never have heard of them. Change that immediately, because: milk dip! Stone Fruit and Blueberry Crisp Stone fruit and blueberries make a perfect marriage in this wonderful crisp. Cherry Blueberry Slump When you want a cobbler but don’t want to turn on the oven, try a slump instead. It cooks right on the stove top. Miniature Strawberry Buttermilk Buckle Old fashioned goodness. Sweet strawberries with the tang of buttermilk, and mini, so you don’t have to share. Old-Fashioned Skillet Cherry Cobbler Classic cherry cobbler. It doesn’t get much better. Fresh Peach, Raspberry, and, Blueberry Cobbler Peaches, raspberries, and blueberries with biscuit topping. So good. Mixed Cherry-Berry Grunt Cousin to a slump, the grunt also cooks on top of the stove for days when it’s too hot to bake. Pineapple Summer Cake Homey and wonderful, who wouldn’t want a slice of pineapple summer cake to round off their picnic meal? Fresh Cherry Blueberry Cobbler Cherries and blueberries, together again. This time in a delectable cobbler. There’s a reason these 2 fruits are often paired. Nectarine Berry Cinnamon Crisps (Gluten-Free) Another stone fruit-berry combination, and this one is gluten-free. If you’re a fan of textural contrast, crisps are right up your alley. Blueberry Coconut Crumble Bars Juicy fruity crumble might not travel so well, but these blueberry coconut crumble bars will go wherever you’re going. Strawberry Rhubarb Upside Down Cake A classic summer combination, strawberries and rhubarb pair beautifully in this upside down cake. Old-Fashioned Peach Cobbler Maybe my favorite summer fruit, it doesn’t get much more classic or tasty than this. And there you have it. 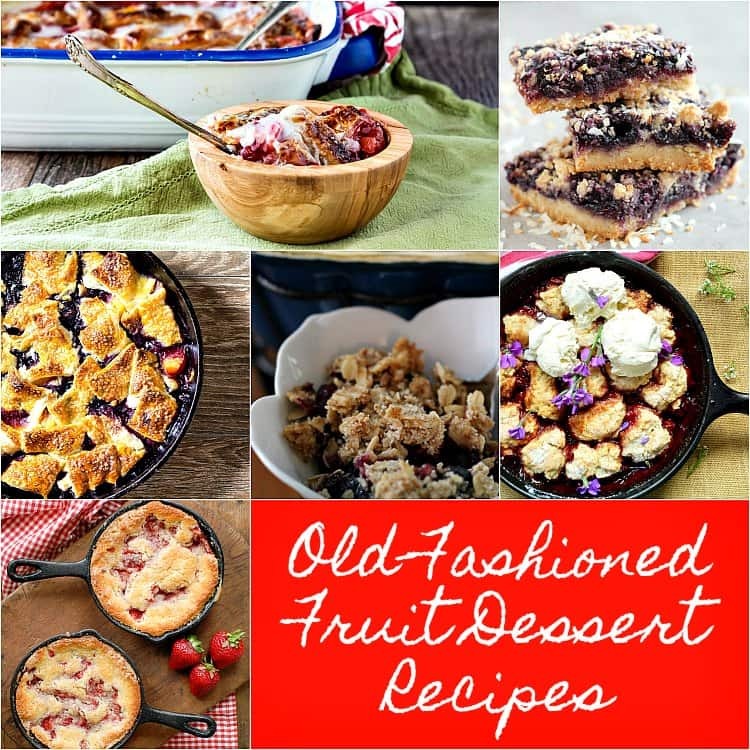 Thanks to all my blogging friends for helping me put together this round up of old fashioned desserts! I hope you all enjoy them. Thank you so much for including me! Yay! Love that peach cobbler, Kelli! Thank you so much! Thanks for including me Jenni! Thanks so much for that crisp, Jane! It is always good to offer gluten free options, especially delicious ones! Wonderful round-up of pies and cakes! Thanks for linking to my Pineapple Summer Cake. These desserts are great all year round and I’m on a mission to try baking them all. Thanks for sharing, Jenni! What a delicious plan, BA! I appreciate your sharing your pineapple cake! Thank you Jenni for including my Fresh Peach, Raspberry and Bleberry Cobbler recipe. You have some really good ones here! Thank you so much for letting me use it! Hope you had a wonderful 4th!